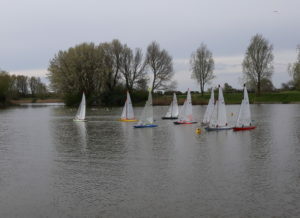 The second meeting of the PRACC series was held at Apex Lake Burnham-on-Sea on Sunday the 14th of April hosted by Sedgemoor Model Boat Club. Entrants taking part were from Eastbourne, Poole, Bideford, Woodspring and Sedgemoor Clubs. The first race started at 10.00am with a fair breeze from the east south east at approximately 10 knts . 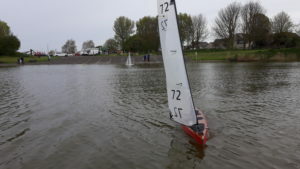 This wind held fairly constant through the day and the triangle course of two laps did not have to be relayed during the day’s racing, enabling 21 races to be completed before the 3.30pm finish. 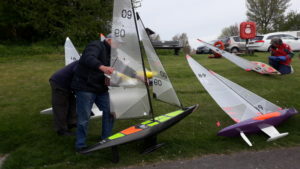 Our thanks to the members of both yachting sections of Sedgemoor MBC for being the race observers, which meant no observers had to be drawn from the fleet. 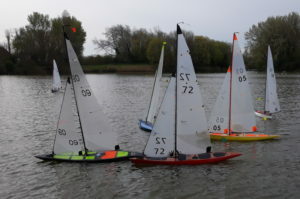 The standard for the day was set by Peter Wiles of Poole who demonstrated the art of ‘A’ class sailing by winning 15 of the 21 races with his lowest place being 3rd. (final score of 21pts) This resulted, as the day progressed, in the competition being about 2nd place. The morning session saw some close sailing amongst the rest of the fleet with no clear contender for 2nd place. 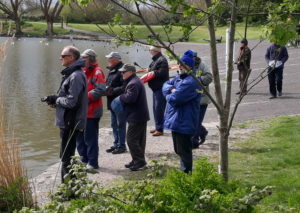 At the lunch break the competition for 2nd position saw John White (Bideford), Nigel Clarke (Sedgemoor), Richard Aucott (Sedgemoor) and Bob Iles (Poole) all within a few points of each other. The afternoon session started with the wind being a bit tricky at the windward mark but this improved later in the session. John White strengthened his position to take 2nd place with 53pts. 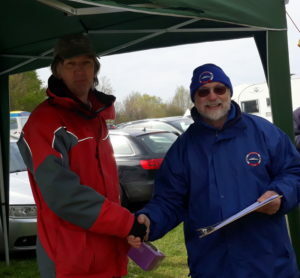 Nigel Clark just edged into 3rd place by one point ahead of Richard Aucott, (66pts to 67pts). A good enjoyable day’s sailing for all concerned.